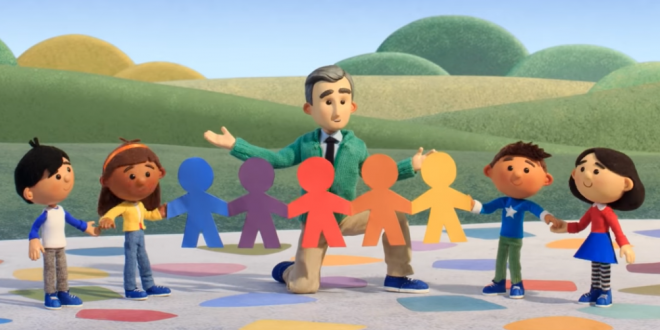 Google Doodle Celebrates Mister Rogers [VIDEO] - Joe.My.God. People the nation over are waking up to a new Google Doodle that is sure to bring a smile to millions of faces. It’s an extended Doodle done in memory of the first day of filming of the iconic children’s television show, Mister Rogers’ Neighborhood. The Mister Rogers Google Doodle comes with a full cast and crew. It was directed by Melissa Crowton and Olivia Huynh and made in collaboration with Fred Rogers Productions, The Fred Rogers Center, and BixPix Entertainment. The Doodle is trending at #1 on Twitter this morning.